Click here to read an excerpt from Who Pardoned Accountability? Have you ever sat in a meeting at work and thought, "Didn't we talk about this same issue in the last six meetings?" or "Didn't J.B. say he would take action on that problem three weeks ago?" Do any of the following look familiar to your organization? Meetings do not start on time or lack focus. Issues/conflicts are not openly addressed. Results are not tracked or reported in a meaningful way. Decisions are not made in a timely manner. There is a low level of flow of communication/information. People do not keep their commitments. What's missing is accountability. How can we increase accountability in our organizations and decrease the frustrations of our employees? That's what you will learn in this witty whodunit in which an important Change has died and Accountability is arrested and accused of involuntary manslaughter. In this "trial of Accountability," we learn why Urgency is late, Commitment is missing, Vision is blindsided, Communication goes silent and Performance falls. A surprise witness sheds light on the crime and the judge has an important decision to make. A model for organizational accountability in the back of the book, along with a case study and a personal and organizational self-assessment of accountability will help your organization on the journey to a higher level of accountability. Buy the e-book edition of Who Pardoned Accountability? for your Amazon Kindle and Kindle reading apps by clicking here. 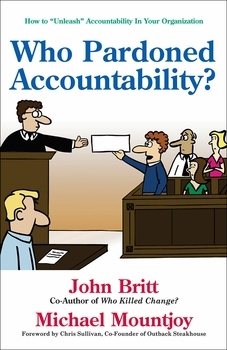 Buy the e-book edition of Who Pardoned Accountability? for your NOOK and NOOK reading apps by clicking here.